More shawls! Looking through the cotton bin we have a large collection of hand dyed cotton in blues, greens and purples. Looking through the blog I found that we had dyed them back in 2014, definitely needed to be used. We dyed two types of cotton, the large bone coloured cone is a very round cord and the two pink cottons are a softer ply. The cotton is 2/16, 2/20 or even 2/30, pretty hard to tell. The pink cotton was dyed a pretty purple and light blue, which is what I used. Mum is also weaving shawls from this pile of cottons and she chose three different shades of blue to create an ombre effect but her thread is the round cord and she set her warp to 30 epi. As my yarn is a little bigger and softer I was able to set my epi to 28. I am using 2/8 Tencel as the weft because there are lots of colours to try. 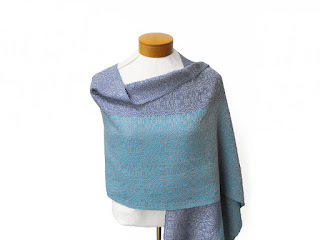 The idea for the shawl was to use a colour similar to the purple and have a solid block of purple and have the pattern highlighted on the blue side. But the shades of purple that I tried just washed out the blue. I also tried two shades of grey, charcoal and silver. The charcoal killed the purple and the silver was too light but as I looked at it more and more it seemed to work. So, thinking what the heck, I went for it. 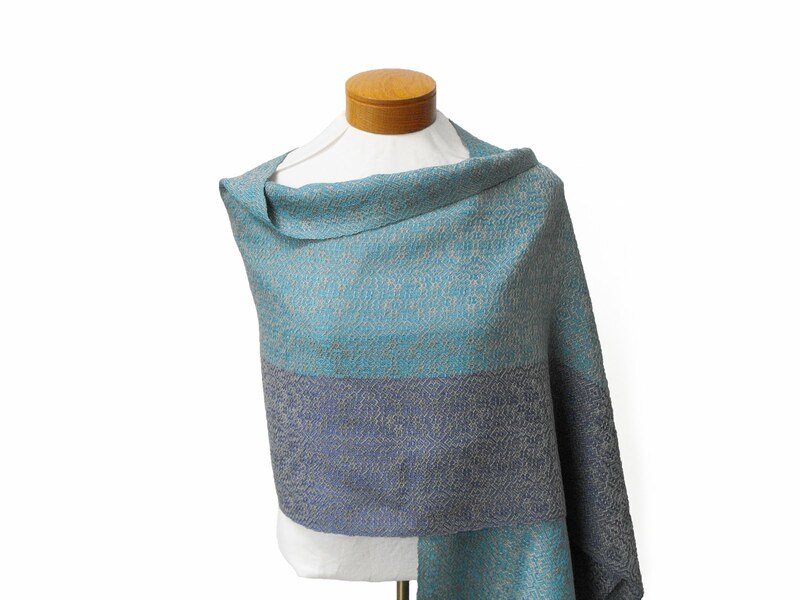 The pattern is an eight shaft twill that has lovely large ornate crosses. The pattern is really highlighted on the purple side and is more subtle on the blue side. For the second shawl I tried some contrasting colours: gold, greyed teal, mineral green and a pale green called Birch. I was quite tempted by the gold but I went with the pale green, it is quite similar to the silver and made nice with both the blue and purple in the warp. 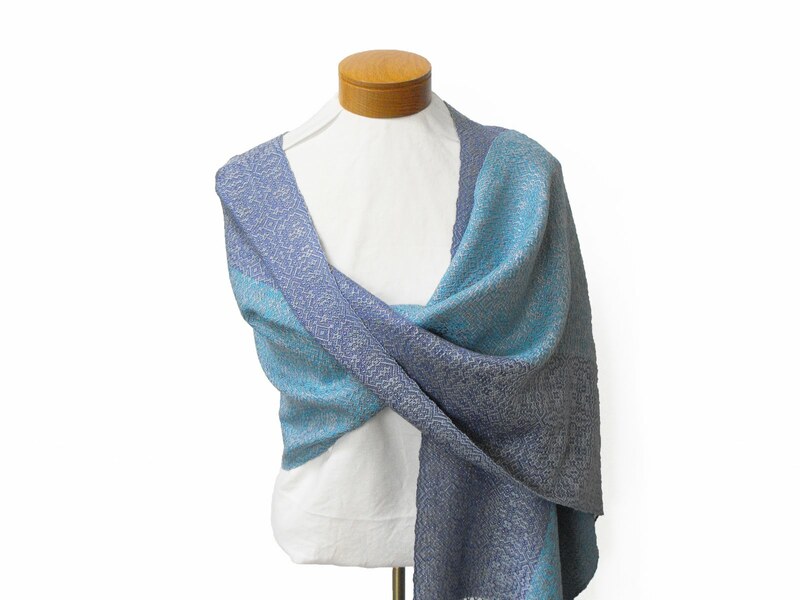 The pattern is very similar to the first shawl; the only difference is that the centres of the crosses have a double diamond instead of a single diamond. 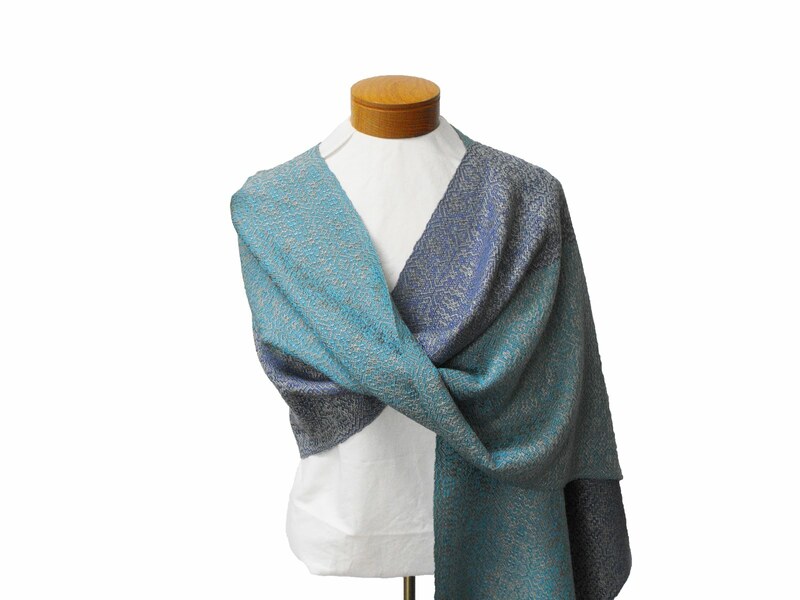 The finished shawls are amazingly lovely; they are lightweight and have a great drape. The silver one is quite understated and elegant and it sold immediately. The pale green shawl has an interesting pale gold shimmer to it that really highlights the pattern and of the two it is my favourite. For Sale. Final Garden Shot is of a bunch of crazy looking Hair Alliums.